Assam Public Service Commission invites application from Indian Citizens for the under-mentioned posts under Assam Government in the scale of pay as indicated below and carrying usual allowances as admissible under Rules of the Govt. of Assam. b. The last date of receiving duly filled up application form in the Commission’s office is fixed on 16.01.2016. - M.D.S. or an equivalent qualification recognized by Dental Council of India. - Minimum of four Research publications indexed in index Medicus/ National journal and one Research Publication in international journal. The ONLINE APPLICATIONS are invited from Indian Citizens for the posts of Junior Residents (non-PG linked) for January, 2015 session in in the pay scale of Rs.15,600 – 39,100 + GP 5400/- per month plus all allowances including NPA, in the prescribed format and on the terms & conditions given in detail on Institute website – www.aiimsbhopal.edu.in . Last date for online submission of application for these posts is 25th November 2015 (by 17:00 hrs). Pedodontics & Preventive Dentistry Department – 02 Nos., Orthodontics Department – 01 No., Oral & Maxillofacial Surgery Department – 06 Nos., Conservative and Endodontics Department – 03 Nos. and Prosthodontics Department – 03 Nos. of this Institution. Applications in Prescribed forms are invited from eligible Dental professional candidates in general / reserved category for appointment on Purely Temporary and ad-hoc basis on vacant posts of Professor and Assistant Professor in Govt. Dental Colleges, Ahmedabad and Jamnagar as per attached notified list. Waiting list will also be prepared for advertised vacancies in the concerned subjects only. Walk in Interview to the posts of JUNIOR RESIDENTS (BDS) purely on Adhoc & Emergent basis in G.T.B. Hospital, Govt. of N.C.T. of Delhi for initially for the period of 89 days extendable for upto one year with mandatory break of one day after every 89 days on the basis of satisfactory work & conduct report from the concerned HOD on request from the doctor concerned or till the fresh incumbents joined on Regular/Contractual basis whichever is earlier & their appointment may be terminated earlier on joining of JR’s on Regular/Contractual basis. (a) Qualification:-BDS Degree from a recognized university/Institute. (b) Registration: The Candidates must be registered/applied with Delhi Dental Council. (c) Candidates who have completed internship before 01.09.13 are not eligible. State Bank of Bikaner & Jaipur invites applications for the emplanelment of Dental Clinic for Dental treatment of the employees. 1. The empanelment of Dentist will be on retainer basis on monthly fixed remuneration and will not charge any consultation fee from our employees visiting their clinic. 2. The empanelment of Retainer is purely on temporary basis for a period of one year on the terms & conditions agreed between the Bank and the Dentist and may be extended on the basis of the quality of services rendered by the Dentist. How to Apply: Duly filled-in applications in prescribed application format along with copies of required documents should be reach to: Chief Manager, State Bank of Bikaner & Jaipur, Industrial Relations Department, Head Office, C- Scheme, Tilak Marg, Jaipur. The Last Date to apply : 7 September 2015. 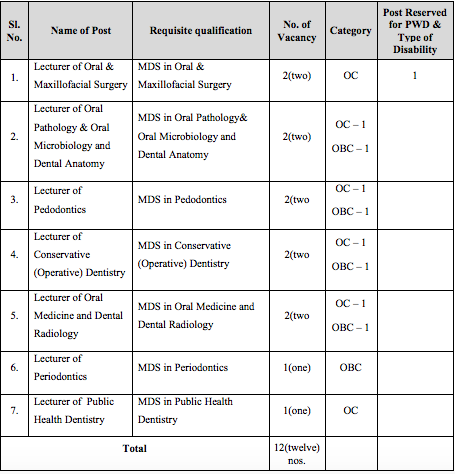 Goa Public Service Commission has invited application for filling up the Dental Faculty posts in Goa Dental College. Last Date for Applying Online: 20-08-2015 till 11:59 pm. Motilal Nehru National Institute of Technology / MNNIT Allahabad has invited application for filling up the Dental surgeon post purely on contract basis by walk in interview. Qualification : Minimum Bachelors degree in Dental Surgery. Candidates having PG Qualifications in respective branch would be preferred. Working hours : 02 hours per day and 06 days a week. Walk-in-interview for the post of Dental Surgeon (Part Time 9.00Am to 2.00PM- 5 day a week) contract basis for one year or till the regular post will be filled up whichever will be earlier at ESIC Model Hospital, Village: Katha, Baddi, H.P.. Accordingly, the eligible and desirous candidates fulfilling the qualifications/eligibility conditions as under should appear for a walk in interview along with one set of attested photocopy of the relevant documents in support of Age, Qualifications, Attempt , Mark Sheet, DCI/State Registration, Category & experience certificates. And two recent passport size photograph. RASHTRIYA CHEMICALS & FERTILIZERS LIMITED Human Resource Department (Trombay Unit) Ground Floor, Room No-5, Administrative Bldg., Chembur, Mumbai – 400 074. RCF Ltd. (Trombay Unit) , having its well equipped medium size Hospital located at Chembur, Mumbai-400 074 catering exclusively to medical needs of its employees and their dependents requires Doctors in the following specialties for honorary assignment as visiting doctors for providing OPD, Consultation, Surgeries and in emergency services. The tenure of appointment will be for a period of two years. Specialist Doctors possessing qualification and experience as detailed below are eligible to apply.